Run an ad hoc backup. 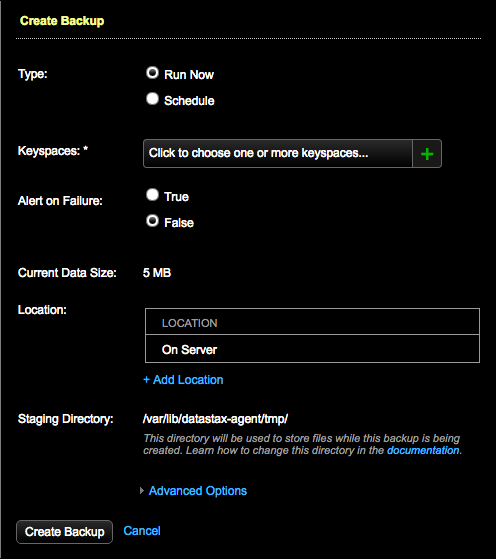 A one-time backup runs only once and starts immediately after creating the job in the OpsCenter UI. You can also schedule a one-time backup that does not repeat if you do not want to run the backup now. The Create Backup dialog appears. The Run Now option is already selected for the backup Type. The ad hoc backup starts running. A progress dialog displays the status of the backup operation. If the progress dialog is closed, you can continue to view the operation in the Activities tab.